Socialist Workers? From the protest event Facebook page. Occupy San Diego is as lazy as ever; they protested a family services organization yesterday outside of Scripps-Mercy Hospital1 here in Hillcrest for just a two-hour period. I can’t find any reporting on it except for the one announcement on the community Reader, and that didn’t even get the Facebook link right. I didn’t even see it—my girlfriend came back from a walk, asked me if I knew anything about it, and handed me the fliers they’d given her. We went by later, but they were already gone. What is the name of this insidious organization luring unsuspecting women into its clutches? Culture of Life. 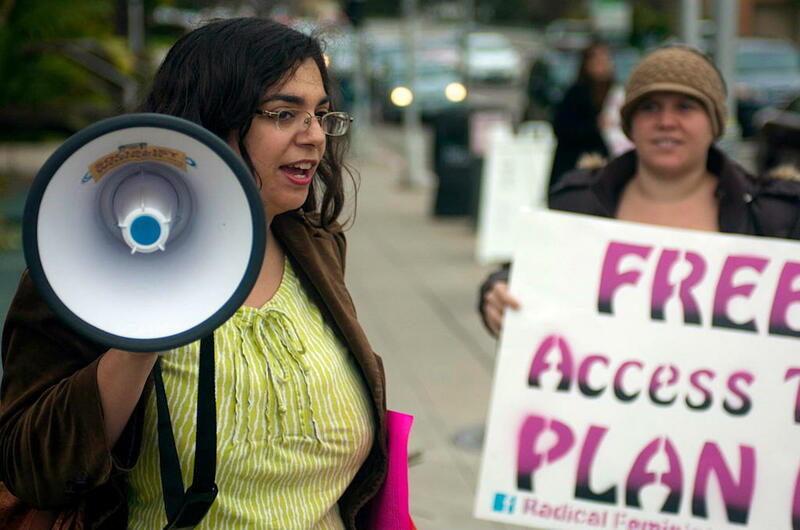 The flier from “The Radical Feminists of Occupy San Diego” says that “Culture of Life has a telling name…”. Telling? You think maybe honest might be a better word? The Culture of Life web site is filled with pictures of babies, and the welcome text is “Welcome to Culture of Life Family Services! We offer quality Christ-centered medical care.” As I’m writing this today they are advertising two events, one of which is “3rd Annual Pro-Life Gala & Auction”. I think the left has become so used to their own Orwellian names and tactics that they don’t even think about what words mean any more. They expect all names to have as much meaning as “Planned Parenthood”, “family planning”, and “reproductive services”. It’s like when it turned out searches for abortions didn’t find many abortion clinics on the Apple iPhone. They screamed that Apple Computer—Apple Computer—was part of a right-wing plot, without any thought to the reality that relatively few abortion clinics used the term abortion in either their names or their services. If you’re going to Culture of Life, you are looking for alternatives to abortion. They aren’t picketing an anti-choice organization. They’re picketing choice. In response to California 2012: 2012 is going to be a very important election for San Diego. Do we continue to reform the city’s financial state, or do we resume the path to insolvency? Scripps-Mercy Hospital in Hillcrest is a private, partially-Catholic hospital (Mercy Hospital was started by the Sisters of Mercy in 1890, and merged with Scripps in 1995) with, I’m guessing, the coolest nuns ever: the hospital takes up the entire 4000 block of Fifth Avenue, and they chose 4077 as their address. “Founded in 1890, Scripps Mercy Hospital is San Diego’s longest established and only Catholic medical center, with campuses in San Diego and Chula Vista. Scripps Mercy provides professional expertise, leading-edge technology—and a very special brand of care. Our commitment to quality patient care is based on the ethical and cultural precepts of the Catholic tradition, which inspire the role of spirituality in the healing process and the humanistic treatment we give to our patients and staff. I like how they put “pregnancy center” in scare quotes. Because only organizations that end pregnancies are true pregnancy centers in their Orwellian world. Evil doesn’t win by being evil. It wins by convincing us that it is virtuous. Pregnant women know, instinctively, that they are carrying a child. But we have allowed ourselves to be convinced as a society that they are wrong. Former Austin mayor confused, faint because of new laws that presume adults are children. The non-profit plans to compete with market leaders on speed, quality, and taste, to bring healthier, happier babies to a new convenience demographic. A couple of people have set up some very nice tents at the University of San Diego. USD is a small, private, Catholic university here in San Diego. The Apple TV brings app-store functionality to the big screen. It beats the hell out of all built-in Smart TV interfaces I’ve seen. I’ve not only cut the cord with cable television, I’ve cut the cord with all monthly fees. San Diego Pro-Choice and the Meaning of Life last modified March 17th, 2012.